Home » I Didn't Know He Said That! I Didn't Know He Said That! “The law of sacrifice was ended upon the cross and a new era was inaugurated, the era of the gospel of the Lord Jesus Christ which would give men the opportunity to serve God in the spirit of love.”—Joseph L. Wirthlin, Conference Report, April 1948, 144. “The sacrifice which the Father gave of his Only Begotten Son ended sacrifice by the shedding of blood.”—A. Theodore Tuttle, “The Message of the Restoration,” Ensign (Conference Report), June 1971, 69. “With the sacrifice of Jesus, ‘the performances and ordinances of the Law of Moses’ were fulfilled (4 Ne. 1:12), and his death ended the practice of sacrifices on an altar. To his disciples in the western continents, Jesus said that he would no longer accept burnt offerings, but that anyone who believes in him should offer a broken heart and a contrite spirit (3 Ne. 9:19-20; cf. D&C 59:8).”—Gloria Jean Thomas, “Sacrifice,” in Encyclopedia of Mormonism, ed. Daniel H. Ludlow (New York: Macmillan, 1992), 3:1248. 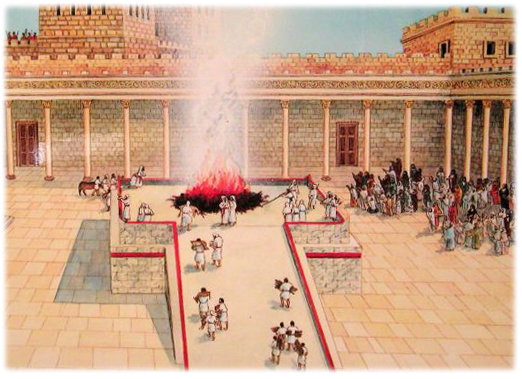 “It does not seem probable that this offering will be a burnt offering. The coming of Christ ended the Mosaic law. The earlier sacrifices were in similitude of the coming sacrifice of Jesus, the Christ. After His crucifixion, death, and resurrection, the sacrament was instituted to keep His sacrifice in constant living memory. It seems more probable that the offering in righteousness, which will terminate the functions of the sons of Levi under the Levitical Priesthood, will be the full acceptance of the gospel, when their Priesthood will come under the direction of the higher or Melchizedek Priesthood.”—John A. Widtsoe, Evidences and Reconciliations, 246. “…the ordinance or institution of offering blood in sacrifice, was only designed to be performed till Christ was offered up and shed His blood—as said before—that man might look forward in faith to that time…. But we will recollect that Abraham offered sacrifice, and notwithstanding this, had the Gospel preached to him. That the offering of sacrifice was only to point the mind forward to Christ, we infer from these remarkable words of Jesus to the Jews: ‘Your Father Abraham rejoiced to see my day: and he saw it, and was glad’ (John viii:56).” Joseph Smith (Jan. 22, 1834), in Teachings of the Prophet Joseph Smith, 60. “Thus we behold the keys of this Priesthood consisted in obtaining the voice of Jehovah that He talked with him [Noah] in a familiar and friendly manner, that He continued to him the keys, the covenants, the power and the glory, with which He blessed Adam at the beginning; and the offering of sacrifice, which also shall be continued at the last time; for all the ordinances and duties that ever have been required by the Priesthood, under the directions and commandments of the Almighty in any of the dispensations, shall all be had in the last dispensation, therefore all things had under the authority of the Priesthood at any former period, shall be had again, bringing to pass the restoration spoken of by the mouth of all the Holy Prophets; then shall the sons of Levi offer an acceptable offering to the Lord…. … it is generally supposed that sacrifice was entirely done away when the Great Sacrifice [i.e.,] the sacrifice of the Lord Jesus was offered up, and that there will be no necessity for the ordinance of sacrifice in future; but those who assert this are certainly not acquainted with the duties, privileges and authority of the Priesthood, or with the Prophets. 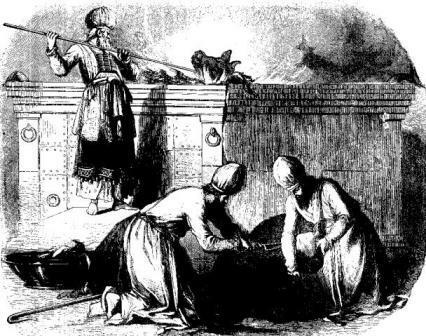 The offering of sacrifice has ever been connected and forms a part of the duties of the Priesthood. It began with the Priesthood, and will be continued until after the coming of Christ, from generation to generation. We frequently have mention made of the offering of sacrifice by the servants of the Most High in ancient days, prior to the law of Moses; which ordinances will be continued when the Priesthood is restored with all its authority, power and blessings…. These sacrifices, as well as every ordinance belonging to the Priesthood, will, when the Temple of the Lord shall be built, and the sons of Levi be purified, be fully restored and attended to in all their powers, ramifications, and blessings. This ever did and ever will exist when the powers of the Melchizedek Priesthood are sufficiently manifest; else how can the restitution of all things spoken of by the Holy Prophets be brought to pass. It is not to be understood that the law of Moses will be established again with all its rites and variety of ceremonies; this has never been spoken of by the prophets; but those things which existed prior to Moses' day, namely, sacrifice, will be continued. It may be asked by some, what necessity for sacrifice, since the Great Sacrifice was offered? In answer to which, if repentance, baptism, and faith existed prior to the days of Christ, what necessity for them since that time? The Priesthood has descended in a regular line from father to son, through their succeeding generations.”—Joseph Smith (Oct. 5, 1840), in Teachings of the Prophet Joseph Smith,, 171-73. “In the restoration of all things, these ancient practices which were given in the beginning—not the carnal law—and which had a bearing on the coming of Jesus Christ, will be restored. That sacrifice by blood should continue to be necessary forever, we need not suppose to be the case.” Joseph Fielding Smith, Church History and Modern Revelation, 1:59. “The death of the Lamb of God at about the ninth hour (3 P.M.) the following afternoon officially ended the practice of animal sacrifice that had been instituted in the days of Adam.”—Rodney Turner, “The Farewell of Jesus,” in Studies in Scripture, Volume 5: The Gospels, ed. Kent P. Jackson and Robert L. Millet (Salt Lake City: Deseret, 1986), 406. But a comment tucked away in an endnote adds: “According to Joseph Smith, the pre-Mosaic practice of animal sacrifice will be reinstituted in connection with the restitution of all things ‘when the Temple of the Lord shall be built, and the sons of Levi be purified’” (425). Turner offers no explanation. It would seem that this teaching of Joseph Smith is little known among Mormons and little understood even among those who know about it. In context, Joseph’s teaching on this point is part of a larger picture. He believed that the Christian gospel had been preached before the first coming of Christ, including explicit references to the name of the Lord Jesus Christ (found repeatedly throughout the Book of Mormon, for example), so that the message was the same before and after the coming of Christ. Furthermore, he came to the view that the people of God needed the same priesthood and the same ordinances after Christ’s coming as before it. He expected a single temple to be built as part of the Restoration. Thus, he stated in that 1840 sermon that sacrifices would be offered again “when the Temple of the Lord shall be built.” The big picture, then, is that in Smith’s teaching the people of God in the Restoration need to have the temple, priesthood, and ordinances of the ancient Israelites fully restored—even including animal sacrifices. It is a surprising claim, but it becomes less surprising when one looks at the idea in the context of Joseph’s broader Restorationist theology. What remains very surprising is that LDS leaders and teachers have given this claim so little attention. Part of the reason for this neglect may simply be that the idea of animal sacrifices has little appeal in modern society. Getting married in a beautiful temple ceremony is one thing; sacrificing a calf on an altar is quite another. Perhaps a more significant reason for the neglect of this teaching of Joseph Smith, however, is that LDS leaders and teachers recognize that the idea of a restoration of animal sacrifice is highly problematic. Such an idea detracts from the completeness and finality of Jesus Christ’s once-for-all sacrifice on the cross for our sins. Yet Mormons can scarcely take the position that Joseph Smith was wrong on this matter. His doctrine of a restoration of animal sacrifice, then, is something Mormons would be hard-pressed to affirm or deny—which may explain why few have said anything about it. Latter-day Saints and orthodox Christians alike generally affirm that Christ's sacrifice made the offering of animal sacrifices obsolete. However, in 1840, Joseph Smith argued that sacrifices would continue to be offered through the priesthood even after the time of Christ.